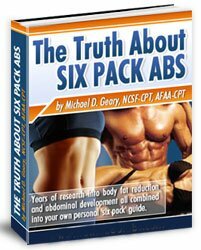 How Do I Get Tight Abs? Guys hate to hear that it will take time and mental discipline to get tight abs that are rock hard and will be on display when you take off your shirt. For some reason, they think a couple of weeks of increased crunches and some extra cardio will have them looking like an NFL defensive back. Sorry, but that is not reality. It took that guy many years of working out and making good food choices to look like that. * To get tight abs that can be easily seen, you MUST get rid of the fat covering them. Changing your diet is the ONLY way. * To get rid of belly fat, you must commit to making good food choices. You must start eating like an athlete if you want to look like one. * Sugar foods are out. Oily foods are out. Fast foods and processed foods are out. * If you truly want to get tight abs, you CANNOT eat like you have been and you CANNOT eat whatever you please. * There are no secret ab workouts for men (or for ladies either.) Doing more crunches and ab exercises will definitely make your abdominals harder...they just will never burn off a sufficient amount of calories. * Strength building workouts are a key element for getting defined abs. * There can be no more mindless cardio on the Stairmaster or stationary bike. If you truly want to get cut, tight abs, you must get strong enough to include interval training workouts. The answer to "How do I get tight abs?" is simple: Eat Less...Eat Better...Exercise More, but the mental discipline it takes to make that work is what sabotages the guys who fail.